Results of laboratory studies suggest that electrical stimulation delivered by a TENS unit reduces pain through nociceptive inhibition at the presynaptic level in the dorsal horn, thus limiting its central transmission. The electrical stimuli on the skin preferentially activate low-threshold, myelinated nerve fibers. The afferent input from these fibers inhibits propagation of nociception carried in the small, unmyelinated C fibers by blocking transmission along these fibers to the target or T cells located in the substantia gelatinosa (laminae 2 and 3) of the dorsal horn. 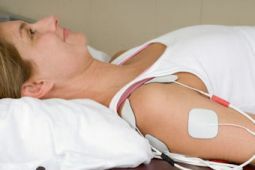 When TENS is used analgesically, patients are instructed to try different frequencies and intensities to find those that provide them with the best pain control. Optimal settings of stimulus parameters are subjective and are determined by trial and error. Electrode positioning is quite important. Usually, the electrodes are initially placed on the skin over the painful area, but other locations (eg, over cutaneous nerves, trigger points, acupuncture sites) may give comparable or even better pain relief.